New ListingNOS Cox Gas Powered Pinto Funny Car Body Kit MIB! New ListingNOS Cox Gas Powered Pinto or Vega Funny Car Parachute and Cover, MIP! New ListingNOS Cox Gas Powered Dragster, Pinto, Vega Rear Axle Assembly, MIB! New ListingNOS Cox Gas Powered Pinto or Vega Funny Car Front Wheels, Tires, Hubs, MIP! Direct drive to the left wheel with very good compression. TD gas car Rough original partial box missing 1 endflap AS IS. red powered .045 special ROy Cox thimble drome tether car with engine. Condition is Used and untested . Being sold as is as found Shipped with USPS Priority Mail. FOR SALE, A REALLY NEAT PENCO CO2 “JET RACER” TETHER CAR RACER.BEAUTIFUL. RED PAINT JOB, STAMPED “PENCO PRODUCT, LOS ANGELES, CALIF.
We do not photocopy these. Discover a Wealth of How-to Projects & Plans. Carved Balsa Hull. The is a tether car with a gas engine. Very hard to find. Car and box contents are in mint, unused condition. Has the decal sheets, instruction sheets, tether string and nail, starter parts, and box cradle. We offer combined shipping when applicable. We will send an updated invoice to reflect combined shipping costs within 1-2 days from the auction end date. Items are shipped within 1-2 business days of receiving payment. Most shipments within the U.S. are shipped via USPS Priority or First Class mail. High value items and international orders are shipped via FedEx or UPS. The exhaust stack on this one is oval in shape and more refined than the standard Hornet engine. The serial number 120 is stamped on the rear cover. It turns over smoothly with very good compression. Car body Tether Car. (USSR 1981). Aluminum chassis material (8mm). Chassis weight (aluminum) - 734gr. Cover material - wood. Weight cover (wood) -244gr. Length is 410mm. USED FOR PARTS OR REBUILD. nothing less. (Actual item shown). Vintage Roy Cox Thimble Drome Champion Tether Race Car, NO. 83 . Condition is Used. Shipped with USPS Priority Mail. Unit is dirty, and rough, see photos. Two old rubber wheels for tether car. Rubber wheel thickness a 6.5 mm. Vintage Mini Teather Car Thumb Oiler,look,nice! BOUGHT THIS USED MANY YEARS AGO AND IT SAT ON A GLASS DISPLAY SHELF. BODY IS IN VERY GOOD CONDITION. NEVER TRIED STARTING IT, SO I DO NOT KNOW IF IT WORKS, I DO NOT KNOW IF ANYTHING IS MISSING. I ONLY BOUGHT IT FOR DISPLAY. Vintage Testors Sprite Indy 500 Tether Car - Nice! Car looks like it was never run.049 motor turns free, has good compression. A nice addition to any collection. Car body Tether Car. (USSR 1986). The material is fiberglass epoxy glue. Car body. Weight -560g. L.M. Cox Santa Anna, California. VINTAGE COX SHRIKE TETHER CAR COX .049 1994. VINTAGE COX SHRIKE TETHER CAR COX .049 1994.. Condition is Used. Shipped with USPS Priority Mail.If you have any questions please ask before buying im very quick to respond. Estate Find. Pre-owned Used Condition. Normal wear from being played with. Light scratches, nicks, etc. It winds up good but does not work after wound. VVINTAGE COX 049 ENGINE PARTS, DUNE BUGGY, JEEP, TETHER CAR. 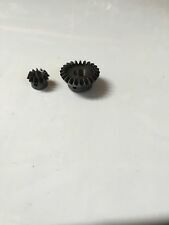 VVINTAGE COX 049 ENGINE PARTS, DUNE BUGGY, JEEP, TETHER CAR.. Condition is New. Shipped with USPS Priority Mail. HERE WE HAVE 2 NEW PULL STARTER CRANKCASE ASSEMBLIES, 5 NEW IN PACKAGE PULLSTART CABLES WITH THE LARGE RED HANDLE THAT SAYS COX, AND A 049 TETHER CAR DRIVE GEAR FOR THE CORVETTE BUT WILL ALSO FIT THE OTHER SERIES OF 049 CARS. BASED ON COX HISTORICAL INFORMATION THE LARGE RED PULL START CABLES CAME OUT AROUND JUNE OF 1971 AS THE OLDER RED AND BLACK PULL START HANDLES WERE MUCH SMALLER. HAPPY BIDDING & BID TO WIN!! SHIPPING TO THE UNITED STAES ONLY. ANY QUESTIONS FEEL FREE TO ASK. COX Gas Power Accessory kit for the 1/20 scale Corvette or Riviera. 1/2 pint Glow Power fuel can in mint condition. Bright, shiny colors and finish. Boxed kit includes (4) Corvette white wall stickers, tether string and misc. Box is roughed up but still there. Not much in the way of scuffs and scrapes. This car is in amazing & stunning looking condition for it's age. There are no cracks in the body & it still retains it's original finish & shine nicely as I hope my pictures will show. The front, back & vents windows are present & in good condition. LOOK! 1960`S ORIGINAL COX GAS POWERED CHOPPER TRIKE FOR RESTORATION! 1960s Cox Tether Chopper Trike. Bike has been in box for years. Selling as resoration. This is for bike only. Does have engine but not tested. Seems preety straight given age. Looks nice and clean without much in the way of scuffs and scrapes. Vintage Cast Aluminum Open Wheel Indy Style Race Car, 8.75"
Vintage Cast Aluminum Open Wheel Indy Style Race Car, 8.75". Condition is Used. Shipped with USPS Priority Mail. And went through 4 kids playing with it! You are buying a Testors JC Penney Super VW Beetle Fuel/Battery Car in Box 1975. Box is marked with JC Penney Tape and VW Bug B112 on outside with Sticker that states Bug. Has one sticker on one side. NOS Factory McCoy Teardrop Aluminum Tank never used! NOS Factory McCoy Teardrop Aluminum Tank. Never used as NEW! Very neat die cast Nylint Thimble Drome Champion limited edition race car with Certificate of Title, re-prints of documents that were included with the original toys and original box. Box has light storage wear. Car is in near mint to mint condition and numbered #3444 out of 5000. I don't believe it was ever displayed. A very nice car to add to a collection or start a new collection and display. Car measures appr. 9-1/2" in length. See the other limited edition Nylint racers I have up for sale today. Vintage COX Thimble Drome Model Airplane Boat Race Car FUEL CAN. Can is empty.i think forbirs age it’s in pretty good shape. Although as you can see in the pictures it does ha be a few scrapes on the can. Condition is Used. Shipped with USPS Priority Mail.